A debut offering with a line-up that features players like; Christian Sands, Michael Dease, Ulysses Owens, Jr., certainly will make you take a second look, but even with this stellar backing cast of players, altoist Daniel Dickinson is not to be dismissed, his command as a player at such a very young age, is just breathtaking. With all the intention, muster and fire that the above players started their careers with, Dickinson too, is a young lion with something masterful to say. “Cry of the Wolf,” kicks of the album with a muscular original written by trombonist Michael Dease, the tune is evidently crafted by a horn player; the lines are inventive and filled with a powerful dark hue. Dickinson’s solo is filled with solid rhythm, building upon motifs with relaxed in the pocket lines. Owens, in his usual masterful style colorizes the track with unobtrusive, yet still driving supportive ideas. Dease and Dickinson trade back and forth in an almost dueling style, Dickinson is up for the task and equally pushes Dease to the climax, then restating of the melody; Dease’s composition is a wonderful vehicle to purvey Dickinson’s talents. The ensemble is a true unit, not just guest artists supporting an emerging newcomer. Dickinson himself is a solid composer as exhibited on seven of the tunes. One in particular that is a real stand out is “Exodus.” One thing that seems lacking in newcomer horn players usually is their maturity of rhythm in their playing. Dickinson exhibits a strong sense of not only well-chosen ideas and lines, but also the laid back confident rhythm that normally takes years to achieve, giving the track a polished not nervous or hurried feel of most youthful players. Dease also is in rare form, you can hear the challenge in the players around him, pushing him to be at his best as well. Dease also, was originally a saxophone player in his youthful years; but mentor Wycliffe Gordon encouraged him to pursue the less crowded field of trombone. I think this is what always give Dease that certain sound that is head and shoulders in the now becoming dense trombone field, is his understanding of agility as a former saxophonist. I think what most strikes me is; I did not feel I was listening to a debut offering, this felt accomplished and relevant as an unknown altoist now ready to make his introduction. To be fair to the work that Dickinson has put into his journey, shows he has been musically minded since his childhood. His gifts have always pushed him forward to new, big ideas, and as his bio states, those that played with him or educators that taught him, immediately saw the natural talents already present, but it was his work ethic and drive that has afforded his advancement these past years. He is described as possessing an unprecedented ferocity, which he credits to his tremendous teaching influences by such world class musicians as Lynne Arriale, Todd Del Giudice, and Bunky Greene. 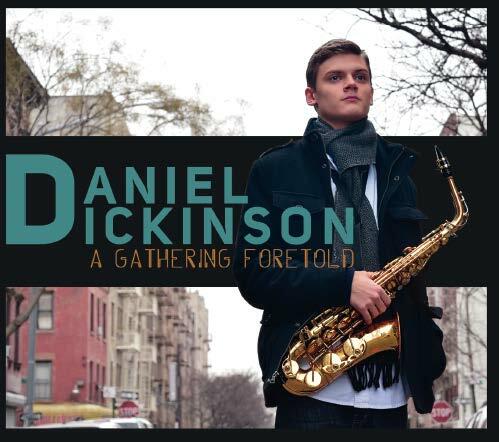 Dickinson has also received numerous honors from organizations at the local, state, and national level, including the 2011 outstanding soloist award from Downbeat magazine, the Jeep McCoy scholarship from the North-East Florida Jazz Association, and has written multiple pieces including some premiered at various consortium’s such as the JEN convention and the Next Generation jazz festival in Monterey, California. Just like the guest artists on his album, he is one to watch, and I am certain we will be hearing much more from this dynamic emerging artist. Congratulations Daniel. Best of luck with this and future projects.